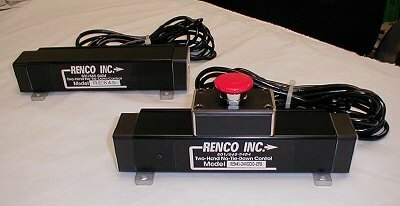 A two-hand no-tie-down control is a device which requires an operator to have both hands on the control (not in a pinch point) in order to activate a cylinder. If an operator ties one button down and attempts to operate the control with one hand on the other button the control will not give an output signal. COMPACT DESIGN WITH 1 3/8" DIAMETER PUSH BUTTONS (RECESSED). INPUT AND OUTPUT CORD INCLUDED. ROUNDED EDGES, NO SHARP EDGES OR CORNERS TO INJURE OPERATOR. QUICK AND SIMPLE INSTALLATION, BOLT THE CONTROL DOWN AND PLUG IN. NO OUTPUT IF CONTROL POWERED UP WITH BUTTONS PUSHED. BUTTONS ARE PRESSED WITHIN .3 SECONDS AND HELD. Two Hand No Tie Down-Electronic control system. Contact sales@airoil.com for additional information. BEAMS ARE BROKEN WITHIN .3 SECONDS AND HELD. INSERT FINGERS TO BREAK LIGHT BEAMS, NO PRESSURE REQUIRED. COMPACT DESIGN WITH 1" DIAMETER FINGER HOLES. INPUT AND OUTPUT CORDS INCLUDED. NO OUTPUT IF CONTROL POWERED UP WITH BEAMS BROKEN. 120V AC INPUT AND OUTPUT. OTHER CONFIGURATIONS AVAILABLE. 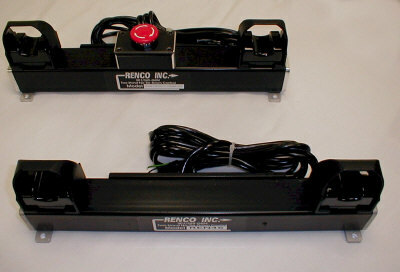 WITH TOP MOUNTED PHOTOELECTRIC SENSORS. COMPACT DESIGN WITH GUARDED FINGER SLOTS.